I'm not 100% about this one but I'm still posting her here, maybe she'll look better in the morning. I am pleased I found a use for this piece of Anna Maria Horner fabric though! It's been sitting in my stash since the baby quilt! I love this! The colours are awesome and your stitch work is pretty impressive! Wow Rebecca, she is fabulous! I love all her gorgeous details and the fabric works perfectly. Great work! You have worked this figure perfectly into the fabric - I love it. It's fantastic Rebecca! Love it!!! I love her too! The new direction you're going to take is just fab! I so loved the disaffected girl you embroidered last year, and this one has the same fabulous posture and feel. Plus I love how you've worked it onto that fabric design! Genius. 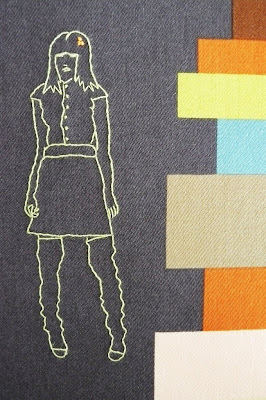 A suggestion if you're still feeling so-so about her in the morning... perhaps you could add a few short horizontal lines, just partial ones along her legwarmers/socks to bring out the rumpled effect more... because that would look uber-cool! She's great but I do agree about the eyes - maybe take Kylie's suggestion and put sunnies on her? I love that she is embroidered on the dark fabric but that the other blocks of colour run up the side. Very urban! Wow love those colours you are using, she is beautiful..
Oh and thanks for your little parcel they are cool and looking forward to sharing them with my girlfriends on the weekend.. I like the sketchy look, and the fabric is just right! love your work, beautiful stitches!